Bare Feats answers the question: How much speed do you sacrifice by choosing Seagate's 250 GB 5400 rpm drive over competing 7200 rpm drives with lower capacity? On the tech front, Dell and Lenovo are shipping notebooks with wireless USB, a wireless protocol as fast as wired USB 2.0. With a wireless USB hub, you can connect to wired USB peripherals. Promising, and Apple will probably adopt it soon. Alienware has notebooks with up to 64 GB of solid state memory - and on the other end of the spectrum there's a $150 Linux laptop. On the small side, Logitech's new notebook mouse has a USB receiver that's not much bigger than the USB connector itself, making it practical to keep it plugged in at all times. "We finally got our hands on a Western Digital Scorpio (WD2500BEVS) 250 GB 5400 rpm notebook drive (courtesy of WiebeTech). Many of you are wondering how it compares to the Seagate Momentus 7200.2 160 GB 7200 rpm notebook drive optional on the newest MacBook Pro and the new Hitachi Travelstar 7K200 200 GB 7200 rpm notebook drive. For power users, these are the three notebook drives of the greatest interest. "We tested them using the SATA, FireWire 800, and USB 2.0 interfaces. SpeedTools QuickBench 4.01 was used. For 'large sustained' test, we averaged the results for 5 runs with 60 MB, 70 MB, 8 MB, 90 MB, and 100 MB block sizes (Extended Test). For the 'small random' test, we averaged the results for 5 runs of 64K, 128K, 256K, 512K, and 1024K block sizes (Standard Test). "Test 'mule' was the 17' MacBook Pro 2.4 GHz 'Santa Rosa' with 4 GB of RAM." "It only took 'em a year and a half to do it, but the ginormous monstrosity that is Apple MacBook Pro 85W MagSafe power adapters have finally seem to have been reduced to a more manageable size...."
"If you own a Titanium PowerBook, you've probably experienced the dreaded paint chipping around the casing edge. Most people leave it alone, or try to touch up the spots with a product like TiPaint. Serious Mac modders, like myself, probably aren't satisfied with a little coverup. I got tired of my PowerBook being all chipped and scrapped up, so I decided to paint it! Here's a step by step guide to help you recreate the colorful PowerBook experience! Read on for the guide and pictures. "A while back I took a G3 iBook and repainted it and made it look (in my opinion) awesome. Ever since then, I've been really bored with my plain ol' TiBook . . . so . . . here's a new guide." "Dell and Lenovo today announced the first notebooks with embedded Certified Wireless USB chips, which will enable cable-free connections to USB peripherals hooked up to Certified Wireless USB hubs that D-Link and IOGear also announced. "Additionally, D-Link and IOGear announced Certified Wireless USB adapters that you can plug into USB ports to add the functionality to notebooks and PCs that don't have it built in." "Eventually, these notebooks and other PCs equipped with wireless USB chips will be able to connect to a new generation of peripherals that will also carry embedded wireless USB." "Wireless USB uses ultra-wideband technology, which enables short-range connections (15 to 30 feet) at much faster speeds (up to 480 megabits per second at 10 feet and 110 Mbps at 30 feet) than Bluetooth while consuming much less power than WiFi." Editor's note: Bluetooth 1.x supports speeds to 721 kbps, 2.x to 3.0 Mbps, and the forthcoming Bluetooth 3.0 protocol will support the same 480 Mbps speed as wireless USB. Wireless USB has the advantage of being available now and letting you use a wireless USB hub to connect to your wired USB peripherals. PR: Alienware is ensuring mobile customers enjoy faster performance and enhanced reliability by now offering solid state drives (SSD) that utilize flash memory on their popular Area-51 m9750, Aurora m9700 and Area-51 m5550 notebooks. In addition to single drive configurations, the Area-51 m9750 and Aurora m9700 are first to market with a 64 GB RAID 0 dual SSD configuration, while also offering dual drive options that combine a 32 GB SSD and a 200 GB 7,200 RPM storage drive. "Alienware's new flash-based solid state drive solutions dramatically accelerate performance for mobile storage applications," said Bryan de Zayas, Associate Director of Product Marketing at Alienware. "From blazing load times to rock-solid durability, all the essential features that customers look for in a notebook are maximized in Alienware mobile systems loaded with solid state drives." By not utilizing any moving parts and not needing to spin up to search for data, solid state drives run quieter, consume less power and find data more quickly than traditional spinning hard drives, making them perfect for the on-the-go lifestyle of Alienware notebook users. "Would you try a $150 laptop powered by Fedora [Linux]? Sure you would. And apparently so are a lot of other folks. "Swedish company called Medison has unveiled a laptop called the Celebrity. Medison's laptop is the latest in a race to the bottom of the pricing barrel. Nicholas Negroponte OLPC is one effort and others are also getting into the act. "...I only cared it was $150." "In an intersection of PC pricing, the cost to make laptops and desktop models has gotten so low that the retail price of each are hovering very close together. "Take for example the One Laptop Per Child (OLPC) Foundation. The group headed by Nicholas Negroponte is considering selling a version of its hand-crank laptop for $350. Conversely, PC-maker Everex is currently offering its full-featured PC in Walmart stores for $298. "Everex isn't the only PC firm beating down retail prices of PCs. Acer this week is offering a full-featured Acer PC for $399. PC prices have been in a relentless drop in the last few years, dropping from $700 to $400 for low-priced models." Link: How Low Can PC Prices Go? PR: The next big thing in notebook mice is really small. Logitech has introduced the Logitech VX Nano Cordless Laser Mouse for Notebooks. The mouse's plug-and-forget nano-receiver provides highly mobile notebook PC and MacBook users with a mouse that simplifies life on the road. Because the USB receiver is so small and is nearly flush with the notebook, people no longer need to constantly plug and unplug it when moving from place to place. "More and more laptop users are abandoning the touch pad in favor of a cordless notebook mouse," said Rory Dooley, Logitech senior vice president and general manager of the Control Devices business unit. "However, with most notebook mice, the size of the receiver forces people to plug and unplug the receiver each time they use the laptop. Because we were able to make the nano-receiver so small, it can remain plugged into the laptop at all times so on-the-go notebook users save valuable time and never have to worry about where the receiver is." The VX Nano mouse's plug-and-forget nano-receiver is the world's smallest USB receiver for mice (when compared with other 27 MHz USB receivers for notebook mice commercially available as of March 1, 2007). When plugged into a laptop, the nano-receiver is nearly flush against the notebook - protruding just 8 mm from the edge of the computer. As a result, notebook users no longer have to worry about the receiver getting lost or snagged. Instead, people can plug in the nano-receiver once and then forget about it - the VX Nano mouse is always ready for use. To maximize productivity, the VX Nano mouse features the MicroGear™ Precision Scroll Wheel, which Logitech introduced last fall in the Logitech MX™ Revolution cordless laser mouse and VX Revolution™ cordless laser mouse for notebooks. When the wheel is in hyperfast scrolling mode, people can fly through long documents with the flick of a finger. To shift to the precise, click-to-click scrolling mode, people need only press and click the scroll wheel. The mouse's Forward and Back buttons enable effortless navigation of Web pages and documents, while a One-Touch™ search button allows people to instantly display results from a favorite search engine. A laser engine ensures smooth cursor control and precision tracking on virtually any surface, and Logitech's 2.4 GHz digital cordless technology provides a robust wireless connection. A premium mouse for the on-the-go road warrior, the VX Nano mouse's low-profile, ultra-portable design ensures that it slips easily into a notebook bag, pocket or purse, while the contoured shape and soft rubber grip provide exceptional comfort. The base of the VX Nano mouse has a trap door that, when opened, reveals two AAA batteries and a storage compartment for the nano-receiver. Plug-and-forget Nano-receiver: Plug this tiny, unobtrusive receiver into your notebook's USB port just once and forget about it. The Nano-receiver makes your mouse always ready for use. Cordless freedom: Expect a robust wireless connection with advanced 2.4 GHz cordless technology. Protective pouch: Use the stylish pouch to protect your mouse when it's not in use. Ultra-portable design: Slips easily into your notebook bag. Attractive style: Complements your active lifestyle with an ultra-slim, sleek design. Hyperfast scrolling: Fly through long documents at hyperspeed with the nearly frictionless scroll wheel, or shift instantly to precise scrolling. Forward/backward buttons: Effortlessly navigate the Internet with forward and backward buttons. Five programmable buttons: Customize the mouse controls to fit your needs with included SetPoint™ software (or, for Mac users, with downloadable Logitech Control Center software). Laser precision: Experience smoother cursor control on virtually any surface. *** The VX Nano outperforms ordinary optical mice. Click-to-click scrolling: Increase productivity with click-to-click navigation of lists, slides, and image collections. The Logitech VX Nano Cordless Laser Mouse for Notebooks is expected to be available in the US and Europe in late August for a suggested retail price of $69.99. PR: LaCie has announced increased capacity for its Mobile Hard Drives Design by F.A. Porsche to 250 gigabytes*. Ideal for data backup, these new drives include either USB 2.0 or USB 2.0 & FireWire 400 interfaces for easy data transfers between computers. This boost in capacity nearly doubles the previously offered capacity for this model. Simply plug these drives in to your laptop or desktop computer's USB or FireWire port to add massive storage for office data or digital files, without the need for a cumbersome AC adaptor**. Mobile Hard Drives Design by F.A. Porsche now have the largest capacities available in a portable drive, at a low price per gigabyte. Housed in a small, sleek case and weighing less than a deck of cards, these mobile hard drives are created exclusively for LaCie by renowned agency Porsche Design GmbH. Exhibiting world-class style and elite performance, Hard Drives Design by F.A. Porsche can be slipped into a shirt pocket for effortless transport. 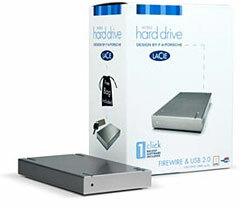 Gain peace of mind by coupling these drives with LaCie's backup software for effortless data protection. Drives are durable and lightweight for transporting from one machine to another, and multiple drives can be stacked thanks to secure rubber feet underneath. The agency is known for creating striking designs for objects as various as motorcycles, cameras, lamps, sunglasses, furniture, street lighting and tramways. Porsche Design evokes a style based on purity, simplicity and elegance, the subtle balance of function and form. **Calculations are based on 900 MB per MPEG-4 (DivX) movie, 1 MB per JPEG photo file, and 3 MB per MP3 song. These values often vary. PR: You may soon need TiPaint if you own a PowerBook G4 "Titanium". 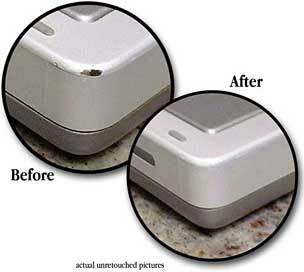 Your TiBook has a paint issue which causes the paint to chip and scratch very easily. If you've owned your TiBook for more than a few months, you have probably already noticed this problem, even if you have handled your TiBook very carefully. We have developed a solution for this problem that will help restore the appearance of your laptop and hide those ugly chips and scratches. We call this solution the TiPaint touchup kit. 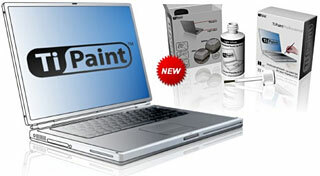 TiPaint is a high-durability enamel paint that has been custom color-matched in a paint lab to cover up your PowerBook's blemishes. When you buy TiPaint we provide you with an applicator that makes it easy to get the right amount of paint on the problem area. We also provide you simple, detailed instructions to help you get the best results. TiPaint matches all Titanium PowerBook G4 models. Manufacturer Application tips: TiPaint is a paint scratch cover-up formulated to match the anodized aluminum finish used by Apple on the PowerBook G4 and PowerMac G5. Because of the reflective properties of anodized aluminum, the color match will vary slightly with changes in lighting. This fact makes it important to use as little TiPaint as possible when covering a scratch on your PowerBook. If the integrated brush is not precise enough for your application, we recommend visiting a hobby store to get a brush with a finer tip. Alternatively, you may use a household item with a sharp tip, such as a toothpick, to apply the TiPaint. With a little extra time and effort spent on application your results will be vastly improved. (*)WLM offers application tips for this product, however "We do not guaranty an exact color match." We offer both colors found on your G4: "Light Silver" for the outer bezel, and "Titanium" for the case itself. You can order the colors individually - or get them both by ordering the professional kit.